What is the Largest Dolphin Species? Believe it or not the largest dolphin species is the Orca, or killer whale. Most people do not realize that Orcas are actually classified as toothed dolphins. 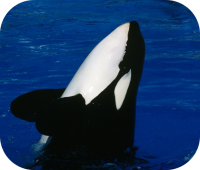 Male orcas grow to approximately 25 feet in length and weigh about 19,000 pounds.